“I am the Rev. Naomi Washington-Leapheart. I am the Faith Work Director at the National LGBTQ Task Force. I am Black. I am a woman. I am bisexual. I am married, by law and by covenant, to another Black woman. We are mothering our pre-teen daughter with pride. I am also an ordained Christian minister. I preach and teach and journey spiritually with people all over this country. Yesterday was Transgender Day of Visibility. Trans people all over the globe courageously lifted up their voices, insisting that we see them, that we hear their stories, that we stand with them, that we struggle with them, that we respect their right to live and live abundantly. But I am heartbroken this afternoon. I am angry this afternoon. Because today I read the news report that Ashanti Carmon, a 27-year-old Black transgender woman, was killed over the weekend. Her life was stolen just 15 minutes from here, just over the DC city line. As I was reading, as I was looking at Ashanti’s smiling face, I imagined her life. Ashanti had dreams. Ashanti had hopes. Ashanti had love. Ashanti had friends. Ashanti had family. She was visible. But she was not protected. She was cherished to those in her private life. But she was vulnerable in public. And, today, all LGBTQ people are vulnerable in public. We have always been here, seen and heard, because we insist on it. But we remain invisible in ways that endanger our lives and undermine our dignity. I stand here as a queer Christian leader to declare that LGBTQ people need and deserve full protection under the law – for our full selves, all the time. As a minister, as a person of moral courage, I believe that Ashanti was God’s beloved. She was covered in full by the love of the One who Created her. But the violence that stole her life was made possible because our country has not fully committed to ensuring that lesbian, gay, bisexual, transgender, gender nonconforming, and queer people are dignified and protected by federal law. 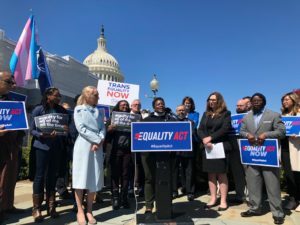 The time is now for the Equality Act – legislation that preserves the dignified lives of all LGBTQ people. for women like Ashanti to experience full civil rights. I am not alone in this proclamation – more than 40 national faith organizations support the Equality Act. It has been suggested that LGBTQ people are impediments to the freedom of religion. I reject that characterization. I declare today that LGBTQ people are not enemies of religious freedom. We are people of faith ourselves. We are faith leaders ourselves. We, too, have an interest in the preservation of religious liberty. We want religious liberty to be protected, not so that our faithfulness can become the only right way to be faithful, but so that people can continue to live into their beliefs – as the majority of Americans do – that all people, including LGBTQ people, should be free to be all of who they are, wherever they are, all the time. My faith compels me to be more open, more compassionate, more benevolent, and that is why I am more committed to supporting the Equality Act. I want a world where my other LGBTQ people can create families without fear of discrimination. I want a world where gender queer students can go to school without harassment or exclusion. I want a world where couples like me and my wife can do business without harm or rejection.